Hearing a concert featuring six premieres is not unusual. However, when those new works are all written by high-school age composers, that is a reason to take note. 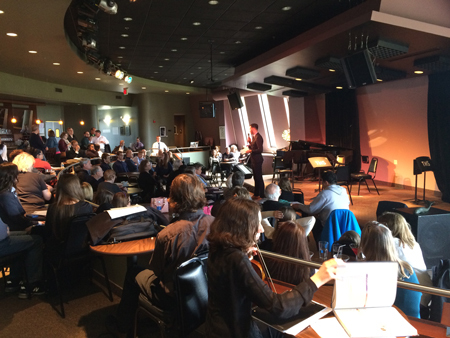 On Sunday afternoon, May 15, a capacity crowd gathered at the Bop Stop to hear an impressive concert that featured works by students in the Northern Ohio Youth Orchestra Young Composers Program. The concert also included performances by ensembles from NOYO’s Chamber Music Extension. The Young Composers Program is a new collaboration between NOYO and the Oberlin Conservatory, and is spearheaded by NOYO executive and artistic director Michael Roest and Oberlin assistant professor of composition Aaron Helgeson. The young composers studied composition with conservatory students Torrin Hallett and Justin Weiss, and their Sunday premieres were performed by Oberlin students Candy Chang, flute, Ryan Toher, clarinet, Flora Hollifield, violin, Aliya Ultan, cello, and Allison Freeman, piano. Introducing his Quintet for Piano, Cello, Clarinet, Violin, and Flute, David Coy said that the instruments represent a group of people, with the piano acting as the authority figure. The well-structured, engaging work is full of triplet figures and lush harmonies. A piano cadenza leads nicely into the concluding section. Maggie Butler’s The Forest in Springtime for cello duo evokes emotions she felt while playing in the woods as a child. Butler, also a cellist, joined Ultan for the performance. The work begins with a baseline in the lower voice, and an inventive, folk-sounding melody joins in. Like an exchange between people meeting for the first time, Brian Pinter’s Conversations Among Strangers for violin and cello unfolds slowly, beginning with an ostinato bass line. But as the people get to know each other, the conversations pick up and quickly become animated with double stops and pizzicatos. Speaking about her work, Claire Dyson said that Serendipity for violin and cello had many incarnations, and the fact that the piece came together at all is serendipity. The piece contains some beautiful lyrical writing for both instruments, the lines weaving in and out of one another. “I didn’t know this was a horrible key for the cello, so give her a break,” Jake Jordan told the audience while introducing his Piano Trio in E-flat, a well-written work early classical in style. Jordan has obviously studied the music of Haydn and Mozart. Interspersed between the premieres were fine performances by members of NOYO’s Chamber Music Extension, beginning with Aleksey Yanshinov’s Variations on an Estonian Folk Song, Op. 83, performed by violinists Emma Shannon, Isaiah Taylor, and Talya Schane. There was some very good playing by violinists Alison Chan and Karah Chapel, violist Stephanie Vento, and cellist Hannah Ross during the four movements of Variations on a Russian Folk Song(no composer identified). With its many technical challenges, Rossini’s Sonata No. 1 in G is not an easy piece, but violinists Ruby Niemojewski and Emily Reyes, cellist Cecelia Ross, and bassist Cade Grant admirably rose to the occasion. Maya Shane and Jessica Tonclear, violins, Natalie Brennecke, viola, and Maggie Butler, cello, brought a full sound along with nice mood and tempo changes in the “Intermezzo” from Grieg’s String Quartet No. 1 in g, Op. 27.